Baez has performed publicly for over 53 years, releasing over 30 albums. Fluent in Spanish as well as in English, she has also recorded songs in at least six other languages. She is regarded as a folk singer, although her music has diversified since the 1960s, encompassing everything from folk rock and pop to country and gospel music. 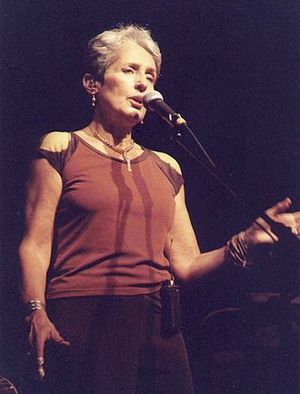 Although a songwriter herself, Baez is generally regarded as an interpreter of other people’s work, having recorded songs by The Allman Brothers Band, The Beatles, Jackson Browne, Bob Dylan, Violeta Parra, Woody Guthrie, The Rolling Stones, Pete Seeger, Paul Simon, Stevie Wonder, Leonard Cohen, and many others. In recent years, she has found success interpreting songs of modern songwriters such as Ryan Adams, Josh Ritter, Steve Earle and Natalie Merchant.